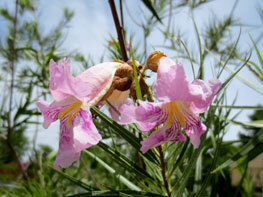 Drought-tolerant, native small trees such as Desert Willow (Chilopsis linearis) serve as excellent specimen small trees for any landscape. Flowering species are available in a variety of color and provide easy-care sources of nectar and pollen for native birds and insects. 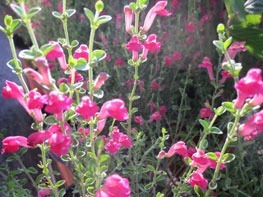 Native perennials with tubular flowers such as pink Skullcap (Scutellaria suffrutescens) and Autumn Sage (Salvia greggii) are favorites of native hummingbirds and bees. Blend a variety of species to extend your bloom season and provide food for an array of native birds and insects. 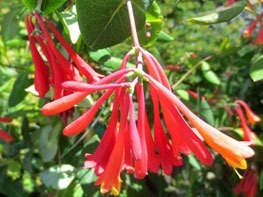 Native vines, such as Coral Honeysuckle (Lonicera sempervirens) provide interest and color year-round. Others, such as Passionvine, are important larval host plants and most provide sources of pollen and nectar for native birds and insects. 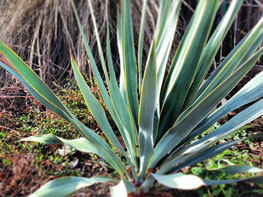 Hardy Yuccas, Agaves and Nolinas create bold, architectural statements in landscapes and containers. Recent hybrids offer a broader color palette and interesting variegations, as well, making them tough, versatile elements of garden design. 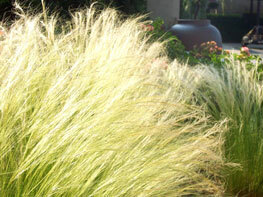 No garden is complete without the subtle textures offered by native grasses. Whether it’s the ultra-silky Mexican Feather Grass (Nassella tenuissima) or a bold, upright clump of Switchgrass (Panicum virgatum), the extensive array of Texas native grasses offers something for every garden. Tough, native perennials that bloom aren’t only for sunny spots. 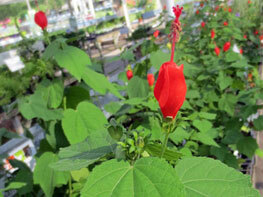 Shade-tolerant species like Turk’s Cap (Malvaviscus drummondii) provide important nectar for native hummingbirds and insects. 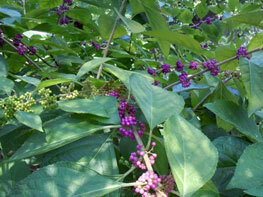 Native fruiting shrubs, such as American Beautyberry (Callicarpa americana) provide structure, color and interest in the landscape. They also serve as an important source for native birds; plant varieties that fruit in different seasons to provide a year-round supply of food for wildlife. 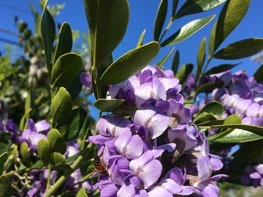 Our native Texas Mountain Laurel (Sophora secundiflora) has a delightful grape soda fragrance when in their glorious springtime bloom. Their evergreen leaves create excellent screening material.